What Kind of Allergies Are Triggered by Cold? Typically, those who have summer allergies may also be at higher risk for having or developing winter allergies. This is because the same allergies that are around in the summer are also nearby in the winter. But surprisingly, there are a variety of allergies that are triggered by cold weather. With a lot more time being spent shut in indoors, and little natural ventilation there's a greater chance you’ll be exposed to to indoor allergens and for longer periods of time. Indoor allergy culprits include dust mites, mold, and pet dander. If you already know your allergy triggers, and it happens to be to mold, pet dander and dust mites, try your best to limit your exposure. Washing bed sheets more frequently, and allergen reducing mattress covers are a good first step. If your triggers are unknow, talk to your GP or an allergist about getting allergy-tested. Limiting your pet’s domain in the home may also help you find some solace. Keeping pets out of your bedroom is essential. Your body takes sleep as a time to heal and recover from the day, and breathing well is a key component of sleep. The last thing you need during this time is aggravation from pet dander. Pet dander can live in the house for months according to experts. Minimize the buildup by doing regular cleanings with dust catchers and vacuuming. Mold grows best in damp areas such as bathrooms, kitchens and laundry spaces. Making sure to deeply clean (i.e. scrub) sinks, tubs, floors and even garbage pails, especially those in these areas, can help keep mold to a minimum. Have a wood burning fire? Be cautious, has mold spores may grow on old wood, and smoke can irritate the sensitive systems of those with allergies. Other things you can do to beat the fight against indoor allergies is stay hydrated with lots of water and teas, and add moisture to the air with a humidifier. Just be sure not to let the moisture level of your home get too high, as this can trigger mold and dust mites. If you’ve been sneezing and blowing your nose a lot, add moisture back into nasal passages and sinuses by trying nasal irrigation with a saline solution. This not only helps with moisture, but clears out dust and debris and can reduce nasal congestion. Cold urticaria, or cold hives, is an allergic reaction some people may have to cold weather itself, or rather, switching to cold exposure rather quickly. This cold allergy is characterized by a swelling, itchy and sometimes blotchy reaction of the skin. Cold Urticaria can be temporary, lasting for a minimal period of time after exposure. But for some, urticaria is a long-lasting condition. One of the more interesting facts about this condition is that it can arise later in life. Experts contend that certain viruses can trigger immune responses in the body, which can eventually make you allergic. Urticaria can also come as a secondary form, as merely a symptom of an infection or underlying condition. If you suffer from cold urticaria, be advised this may not be a reaction that is confined to the winter months or while being exposed directly to cold temperatures. Going for a swim in the summer or taking a hot shower can act as triggers for cold urticaria, as once you get out, the cooling effect of the water on your skin can be enough to also trigger a reaction. 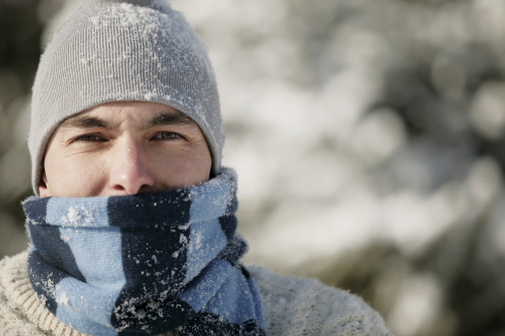 The best way to learn to manage symptoms is to be cautious of your surroundings and bundle up to limit exposure. It’s also very important to talk to your doctor about the best lifestyle tips and medications for you. Although cold allergy symptoms are typically seen in the skin, reactions can also be seen in the blood, in the urine, nose or chest, especially when connected to an underlying condition. Symptoms can range from generalized fatigue to decreased focus to rashes and wheezing. Protect yourself from symptoms by covering your nose and mouth to limit the amount of cold air ingested, and to keep wheezing and nasal dryness to a minimum. Working with your doctor to select the best antihistamine to use prior to cold exposure can also greatly help reduce reactions.